It was a cold winter day in Cape Town. The sun was just beginning to rise – ready for a race and when we departed for site. A drive of about 45 minutes , we arrived with students changing classes on the campus , with a bristle of University activity. We proceeded with our item to the faculty , after all we were here on a mission. The lab was still being cleaned out and was very dusty…workers were still around busy clearing last bits of rubble. Maybe putting the finishing touches to the revamped lab. 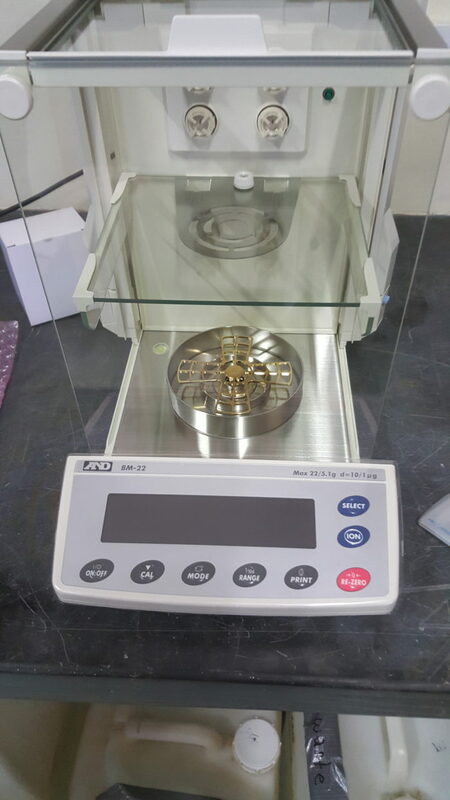 After unpacking the BM Micro Balance , we proceeded with the installation. Unpacking all accessories, leveled the balance and decided to perform a diagnostic test . Switched the unit on and waited….expecting some fluctuations due to the environmental conditions…..we were wrong and amazed ! Five minutes later , and repeated tests with the same sample, the balance was extremely stable , consistent and ready for work , in fact ready for much more demanding work. I left feeling like an under graduate with a masters degree. To block drafts, A&D adopted a double-ring structure around the weighing pan and two vertical shields under the separation plate. This offers more space and easier operation than conventional 1 μg balances with a secondary breeze break in the chamber. Clear, White-back lit LCD Inter lockable Slide Doors A large flask or cylinder can be weighed by removing the separation plate (for a resolution of 10 μg or higher).